Once upon a time not so long ago, bad boys were something that all drama-loving girls would fall for. From Meteor Garden’s <流星花園> Dao Mingsi to Devil Beside You’s <惡魔在身邊> Ahmon, bad boys were the trend that defined idol dramas of the 2000’s. But as we officially hit the late 2010’s, it appears that bad boys are no longer the main act for business. Starting with 2011’s In Time with You <我可能不會愛你>, the “sweet boy”—or warm boy (暖男)—became the one where all girls would fall for. Gone were the days when girls would chase after angsty boys who were broken and mistaken; now all they want is someone who is kind, loving, and supportive. This transition from bad boy and good boy isn’t just happening to Taiwan and Korea—its influence is affecting Hong Kong dramas too. 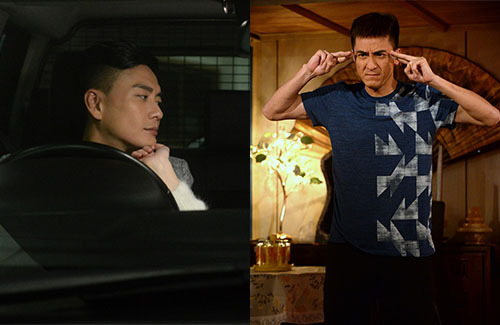 Manipulative bad boys like Bosco Wong’s (黃宗澤) Sheldon in 2016’s Two Steps from Heaven <幕後玩家> got more hate than love, while simpler characters like Kenneth Ma’s (馬國明) Ma Kwai in The Exorcist’s Meter <降魔的> is getting all the love letters. In fact, Kenneth’s good, obedient image is the reason why he is still so popular with girls, despite not having the handsome looks of Bosco Wong nor the athletic image of Vincent Wong (王浩信). The formula for popularity is changing, and it’s exciting to know what would happen next. kenneth ma’s not handsome?! he’s pretty handsome in my eyes. also keep in mind that kenneth’s a more than a few years older than bosco ar. @m0m0 ya Kenneth is well rounded in everything and looks good as well. He has been hot commodity for a long time. Tons of girls in and out of the the industry want him. I think the audience likes bad boys but doesn’t like jerks. Bad boys does not equal jerks. Sheldon was a 1st class jerk who cheated on his wife and his friend and still felt he did no wrong as he was smart. And when he did regret it, he blamed it all on his mistress for ruining his family and hurting his wife, and then he got forgiven as if nothing had happened. Jerk! I am sure the audience will still love a well-written villain or a grey-area character who had valid reasons for doing evil stuff and can feel for his pain or conflicts of the heart. People like Siu Ma as they can connect with him. As for Kenneth, he has always been popular with the audience as he has a healthy image and he is fun as well. He is not cool looking but I do feel he is good looking, even if he has that silly goofy look at times.